This client from Angola came to me requiring a stylish website to sell a wide range of products from fashion to tech gear and shoes. I first created the branding by combining the first letters of Pure Gosto into one symbol that could sit in the middle of the logotype, and we settled on orange as the primary colour. 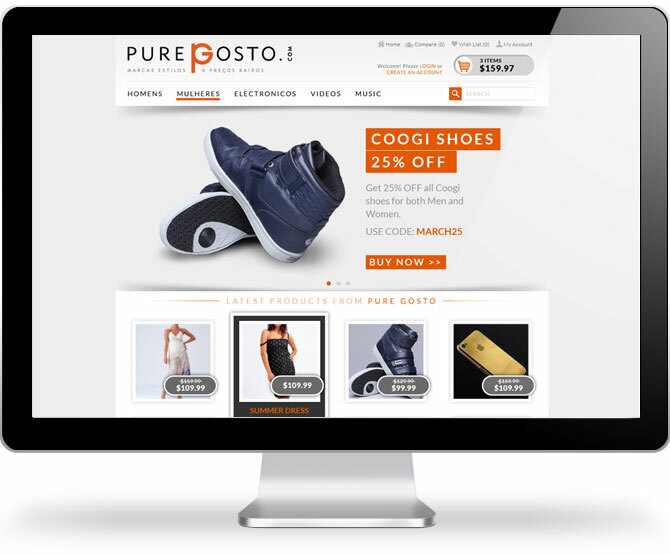 The homepage features a large slider and expanding info panels which appear when hovering over the product images. The product detail page follows all the ‘best practices’ for maximising sales such as large product images in a carousel, prominent “add to cart” button, as well as star rating, and social media sharing buttons. To help minimise page clutter, the side menu of categories is collapsable, as well as featuring related and best seller products.